"Dark Was the Night, Cold Was the Ground"[note 1] is a gospel blues song written and performed by American musician Blind Willie Johnson and recorded in 1927. The song is primarily an instrumental featuring Johnson's self-taught bottleneck slide guitar and picking style accompanied by his vocalizations of humming and moaning. It has the distinction of being one of 27 samples of music included on the Voyager Golden Record, launched into space in 1977 to represent the diversity of life on Earth. The song has been highly praised and covered by numerous musicians and is featured on the soundtracks of several films. Born in 1897, Johnson taught himself how to play guitar and dedicated his life to blues and gospel music, playing for people on street corners and in mission halls. Columbia Records had a field unit that traveled to smaller towns to record local talent. Johnson recorded 30 songs for them at five sessions between 1927 and 1930. Among the first of these was "Dark Was the Night, Cold Was the Ground". The song's title is borrowed from a hymn that was popular in the nineteenth century American South with fasola singers. “Gethsemane”, written by English clergyman Thomas Haweis in 1792, begins with the lines “Dark was the night, cold was the ground / on which my Lord was laid.” Music historian Mark Humphrey describes Johnson's composition as an impressionistic rendition of “lining out”, a call-and-response style of singing hymns that is common in southern African-American churches. "Dark Was the Night, Cold Was the Ground" is 3 minutes and 21 seconds of Johnson's unique guitar playing in open D tuning for slide. By most accounts, Johnson substituted a knife or penknife for the bottleneck. His melancholy, gravel-throated humming of the guitar part creates the impression of "unison moaning", a melodic style common in Baptist churches where, instead of harmonizing, a choir hums or sings the same vocal part, albeit with slight variations among its members. Although Johnson's vocals are indiscernible, several sources indicate the subject of the song is the crucifixion of Christ. His records were sold by the Columbia and Vocalion labels with other blues acts like Bessie Smith, whom Johnson outsold during the Depression years. In 1928, the influential blues critic Edward Abbe Niles championed Johnson in his column for The Bookman, praising his "violent, tortured, and abysmal shouts and groans, and his inspired guitar playing". Johnson's music experienced a revival in the 1960s thanks in large part to the efforts of blues guitarist Reverend Gary Davis. A highly regarded figure within the burgeoning New York folk scene, Davis gave copies of Johnson's records to young musicians and taught them to play his songs. The Soul Stirrers, Staples Singers, Buffy Sainte-Marie and Peter, Paul & Mary all covered Johnson. In 1969, the English folk-rock band Fairport Convention released the album What We Did on Our Holidays which included a song inspired by "Dark Was the Night, Cold Was the Ground" called "The Lord Is in this Place...How Dreadful Is this Place". A compilation album titled Dark Was the Night was released in 2009 by the Red Hot Organization, a charity that raises awareness of HIV and AIDS issues through music. The Kronos Quartet recorded an arrangement of "Dark Was the Night, Cold Was the Ground" that appears on the album. The song "Excavating Rita" by Half Man Half Biscuit on their 2011 album 90 Bisodol (Crimond) quotes the song's title. Singer-guitarist Jack White of The White Stripes called "Dark Was the Night, Cold Was the Ground" "the greatest example of slide guitar ever recorded" and used the song as a standard to measure such iconic rock music that followed in its wake, such as "Whole Lotta Love" by Led Zeppelin. In 2003, John Clarke in The Times wrote that "Dark Was the Night, Cold Was the Ground" was "the most intense and startling blues record ever made". Francis Davis, author of The History of the Blues concurs, writing "In terms of its intensity alone—its spiritual ache—there is nothing else from the period to compare to Johnson's 'Dark Was the Night, Cold Was the Ground', on which his guitar takes the part of a preacher and his wordless voice the part of a rapt congregation." 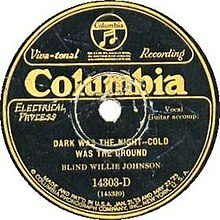 Johnson's recording of "Dark Was the Night, Cold Was the Ground" was selected by the Library of Congress as a 2010 addition to the National Recording Registry, which selects recordings annually that are "culturally, historically, or aesthetically significant". “Dark was the Night, Cold was the Ground” was used on the Oscar-nominated soundtrack to Pier Paolo Pasolini's classic film, The Gospel According to St Matthew, in scenes where Judas Iscariot laments betraying Christ and a cripple asks to be healed. Ry Cooder based his soundtrack to the Palme d'Or-winning film, Paris, Texas on "Dark was the Night, Cold was the Ground", which he has described as "the most soulful, transcendent piece in all American music." Wim Wenders, the director of Paris, Texas, included Blind Willie Johnson's music and life in his 2003 documentary The Soul of a Man, produced for the PBS series "The Blues". In 1977, Carl Sagan and other researchers collected sounds and images from planet Earth to send on Voyager 1. The Voyager Golden Record includes recordings of frogs, crickets, volcanoes, a human heartbeat, laughter, greetings in 55 languages, and 27 pieces of music. "Dark Was the Night, Cold Was the Ground" was included, according to Timothy Ferris, because "Johnson's song concerns a situation he faced many times: nightfall with no place to sleep. Since humans appeared on Earth, the shroud of night has yet to fall without touching a man or woman in the same plight." ^ Because documentation is scarce in early recordings, the title of the song appears differently in many sources. It is often called "Dark Was the Night" or punctuated as "Dark Was the Night (Cold Was the Ground)". ^ a b c Bogdanov, et al, p. 284. ^ "Blind Willie Johnson discography". Retrieved February 19, 2015. ^ a b Humphrey, p. 126. ^ Hill, et. all, p. 70-74. ^ Humphrey, Mark. "The Great Depression: Music from the Era". Blackside. Archived from the original on 15 September 2010. Retrieved 25 September 2010. ^ a b Obrecht, Jas (June 1998). "Can't Nobody Hide from God: The Steel-String Evangelism of Blind Willie Johnson", Guitar Player, 32 (6), p. 57–62. ^ Harris, Jeff (May 2, 2010). "Times Is Hard (So I'm Savin' for a Rainy Day) – The Year 1930 Pt. 1". Big Road Blues. Retrieved 27 September 2010. ^ Mitchner, Stuart (November 9, 2008). "Sounding the Sixties: It All Comes Round Again for Joe Boyd". Town Topics. Retrieved 23 September 2010. ^ Plagenhoef, Scott (February 26, 2009). "Album Review: Various Artists, Dark Was the Night". Pitchfork Media. Retrieved 22 September 2010. ^ Di Perna, Alan (August 2007). "Jack the Ripper", Guitar World, p. 78–94. ^ Ordoña, Michael. (August 23, 2009). If guitar heaven exists, it's 'Loud', The San Francisco Chronicle. Retrieved on January 1, 2010. ^ Clarke, John (December 6, 2003). A Director's Cut, The Times. Retrieved on January 1, 2010. ^ "The National Recording Registry 2010". Library of Congress. Retrieved April 10, 2011. ^ Cadoni, Alessandro (2005). "Cinema e musica 'classica': il caso di Bach nei film di Pasolini". De Musica: Annuario in Divenire (in Italian). Il Seminario. 9. ^ The Soul of a Man, Public Broadcasting Service. Retrieved on September 22, 2010. ^ Sagan, Carl. Murmurs of Earth : the Voyager interstellar record (1st ed.). Random House. p. 178. ISBN 0-394-41047-5. "Jesus Make Up My Dying Bed" / "I Know His Blood Can Make Me Whole"
"Dark Was the Night, Cold Was the Ground" / "It's Nobody's Fault but Mine"
"Mother's Children Have a Hard Time") / "If I Had My Way I'd Tear the Building Down"
"I'm Gonna Run to the City of Refuge" / "Jesus Is Coming Soon"
"Keep Your Lamp Trimmed and Burning" / "Lord I Just Can't Keep From Crying"
"God Don't Never Change" / "Let Your Light Shine on Me"
"Bye and Bye I'm Goin' to See the King" / "You'll Need Somebody on Your Bond"
"God Moves on the Water" / "Take Your Burden to the Lord and Leave It There"
"John the Revelator" / "You're Gonna Need Somebody on Your Bond"
"The Rain Don't Fall on Me" / "Trouble Will Soon Be Over"
"Praise God I'm Satisfied" / "When the War Was On"
"Can't Nobody Hide from God" / "If It Had Not Been For Jesus"
"The Soul of a Man" / "Church, I'm Fully Saved To-Day"
"Go with Me to That Land" / "Everybody Ought to Treat a Stranger Right"
"Take Your Stand" / "Sweeter as the Years Roll By"
This page was last edited on 17 March 2019, at 17:42 (UTC).